Age-related macular degeneration (AMD) is the commonest cause of blindness in the over-50s in developed countries. In one of the latter phases of the disease, geographic atrophy (GA) occurs. This is the stage when progressive loss of the cells of the retinal pigment epithelium (RPE) takes place in conjunction with secondary degeneration of the photoreceptors, which gives rise to central vision loss. Moreover, AMD in its atrophic variant is untreatable at present. It is estimated that it will affect 196 million people around the world in 2020. As a consequence, the research into advanced therapies for vision diseases is a subject of great scientific interest today. 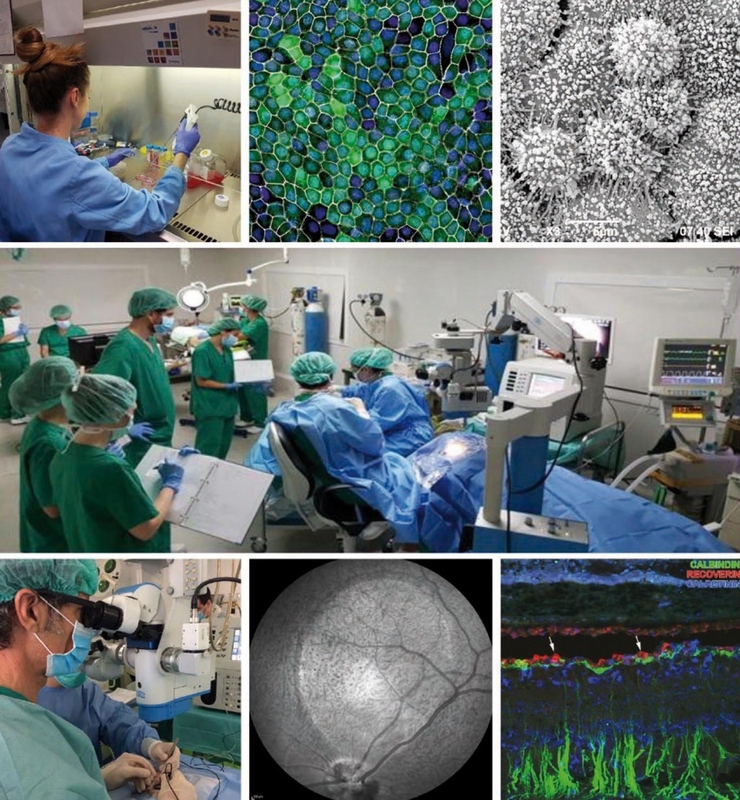 The Barcelona Macula Foundation (BMF), as a partner in the European project ADVANCE.CAT, has spent years committed to research into cell therapy with regenerative aims. Since the start of the project in 2016, the BMF, together with the Centre of Regenerative Medicine in Barcelona (CMRB), the Blood and Tissue Bank (BST) and the Miguel Hernández University (UMH), has endorsed the capacity of induced pluripotent stem cells (iPSC) for differentiation into RPE cells and for implantation and survival in the retina of an animal model. This research has been undertaken at the Preclinical Eye Research Unit, a unit led by the BMF and Specipig. The iPSC were obtained in the laboratory from somatic cells through cell reprogramming. These cells, which have the capacity for differentiation into many cell types, were differentiated to RPE and subjected to strict safety controls to avoid the future appearance of teratomas in the tissue concerned. Once the populations of differentiated cells of the highest purity were selected, trials in animal models commenced. The model chosen is a pig model that reproduces some of the characteristics of human GA through the sub-retinal injection of sodium iodate. The RPE cells were injected into the sub-retinal space of the damaged retina, both within and outside the area of the lesion induced by the sodium iodate. The contralateral eye was maintained as a control without treatment. Main photo: Researchers from the BMF and Specipig at the Preclinical Eye Research Unit. From left to right and from top to bottom: 1) Anna Duarri, CMRB researcher working with stem cells. 2) RPE cells under the confocal microscope. 3) RPE cells under the scanning electron microscope. 4) Dr. Monés performing a subretinal injection. 5) Infra-red image of the eye fundus of the animal after induction of an atrophic zone. 6) Immunohistochemical staining of an atrophic animal retina. After three months of monitoring of the structure through optical coherence tomography (OCT), fundus autofluorescence (FAF) and retinographies, the histopathological study was conducted to assess the safety, integration and survival of the cells. After the joint work of the institutions involved, it was demonstrated that the implanted hiPSC-RPE cells are capable of integrating themselves into the healthy retina and forming an epithelial monolayer. It was also seen that the integration capacity of these cells is not optimal in the atrophic area and they are integrated in an occasional manner in any case. These facts, in a clinical context, could sustain the hypothesis that the use of the iPSC-RPE may possess the integration capacity beyond the limits of GA, which potentially may have trophic or supporting effects with regard to the native cells, thereby contributing to cell survival and slowing atrophy progression. The translational objective, in the mid-term, will be to attempt to promote a Phase 1 clinical trial to assess the safety of this cell therapy and subsequently to begin a second phase to try to highlight the delay in disease progression.